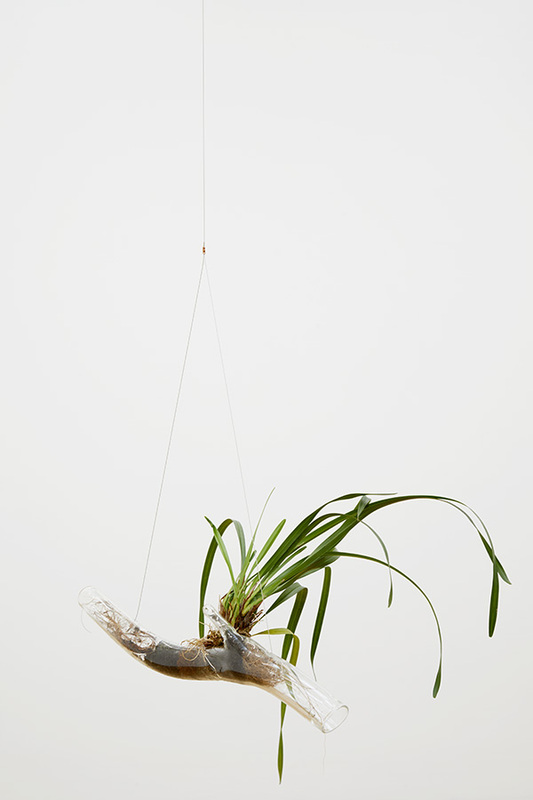 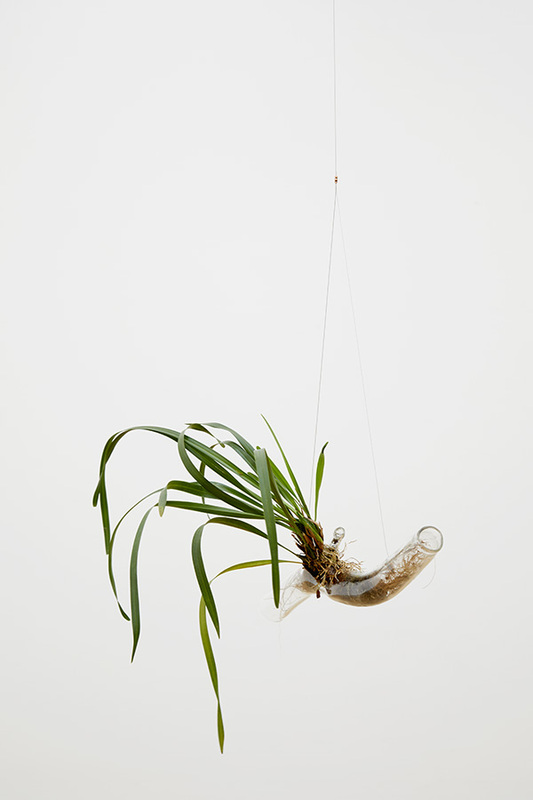 Interested in changing the relationship between nature and culture, Steegmann Mangrané has challenged many times the simplistic idea that a natural and chaotic form sits in direct opposition to a cultural and organised form. 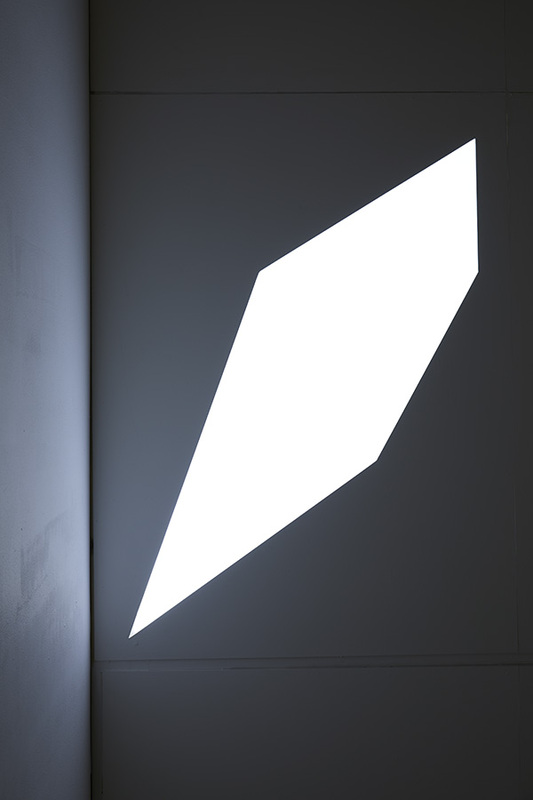 With this new work, he attempts to collapse this opposition by showing that geometric forms can work in organic fashion and vice-versa. 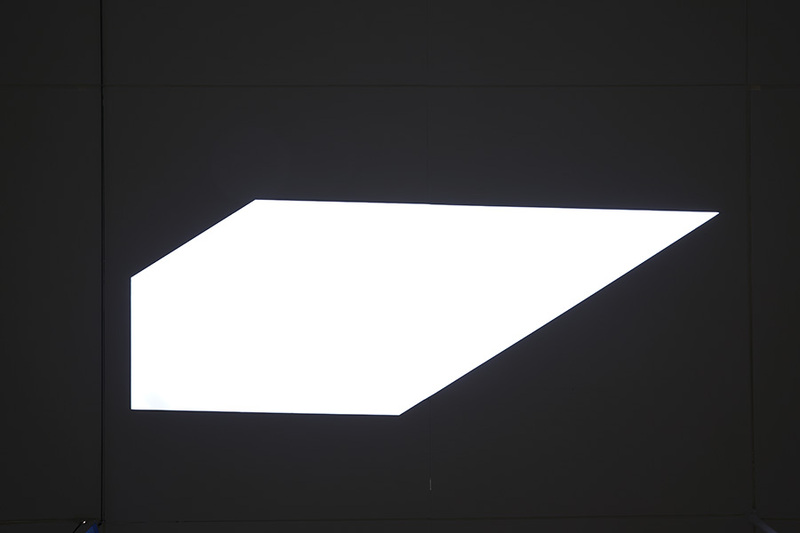 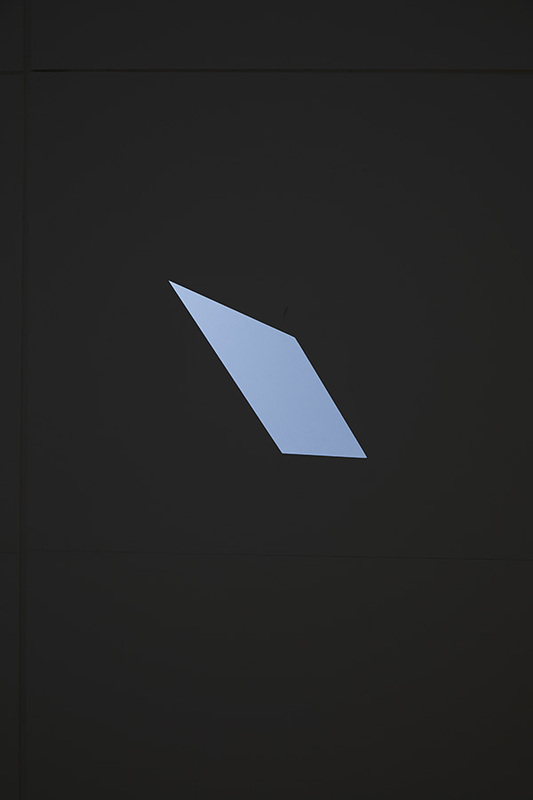 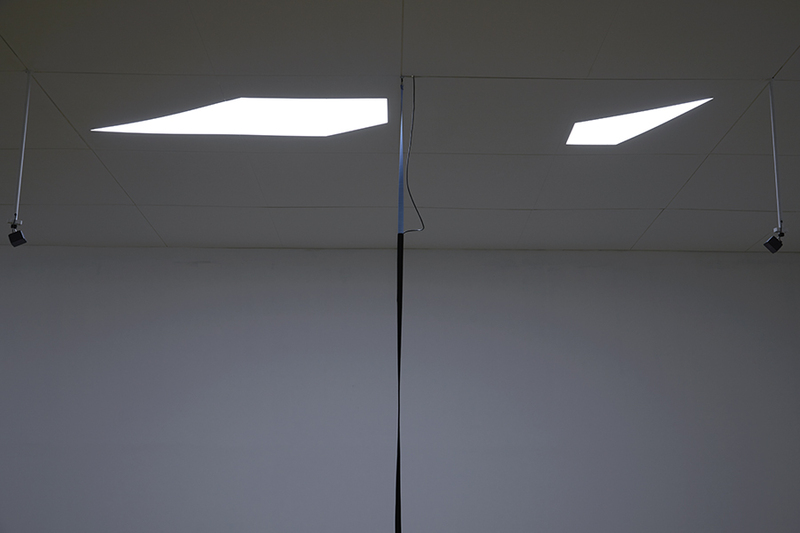 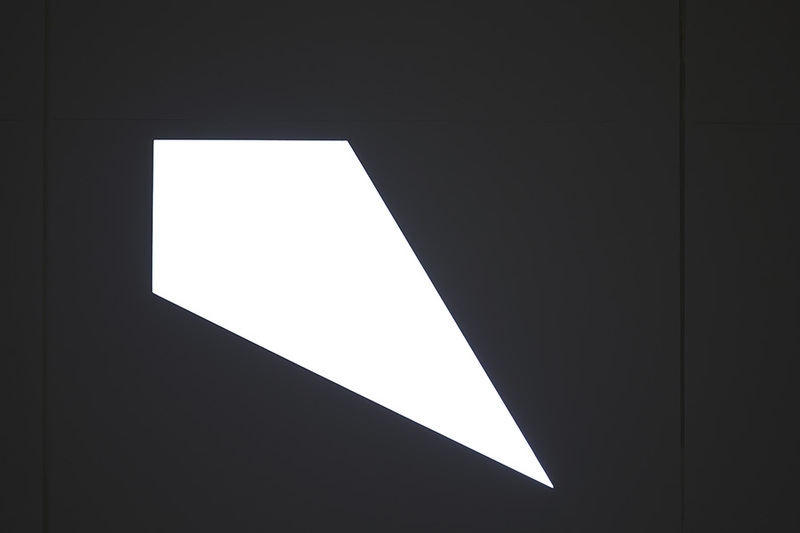 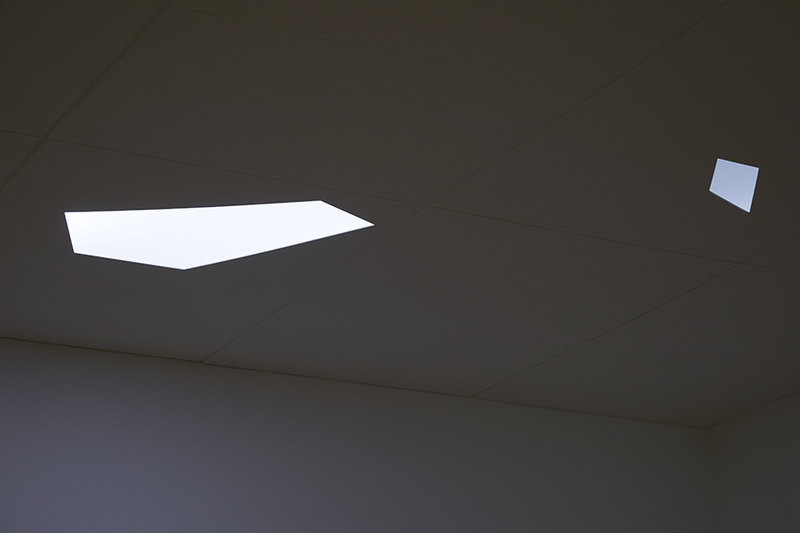 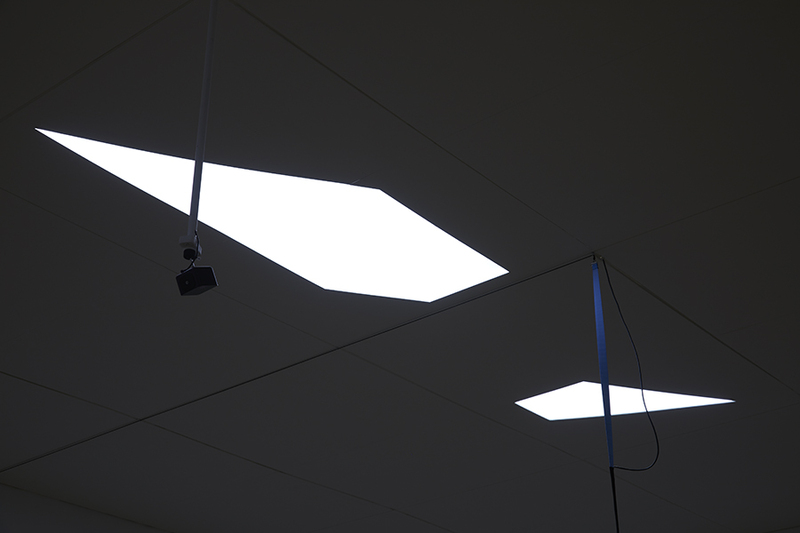 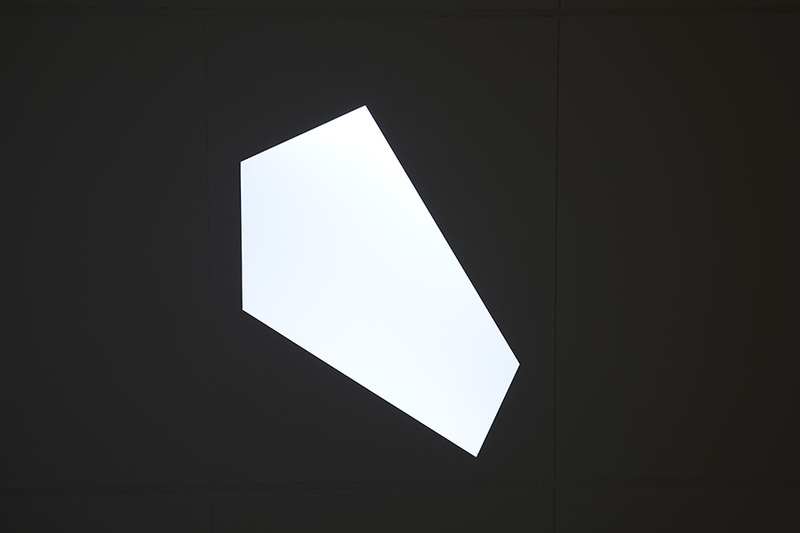 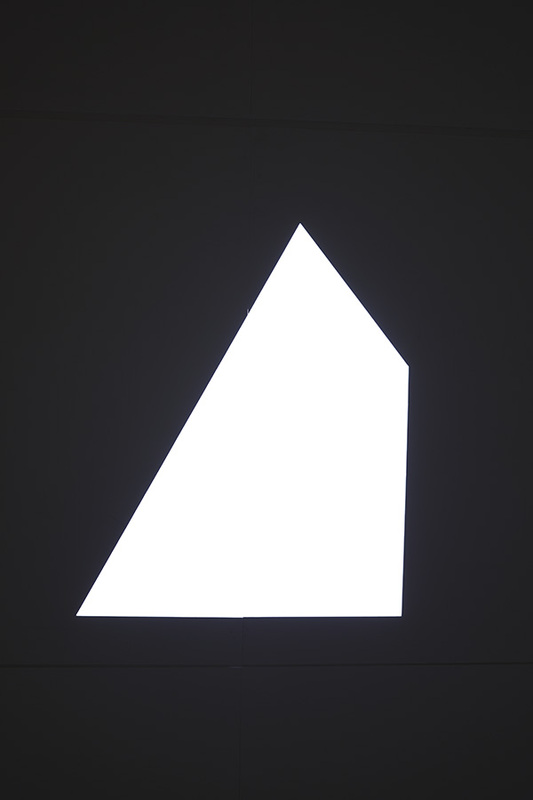 A series of shapes cut into the gallery ceiling allows light into the otherwise dark space. 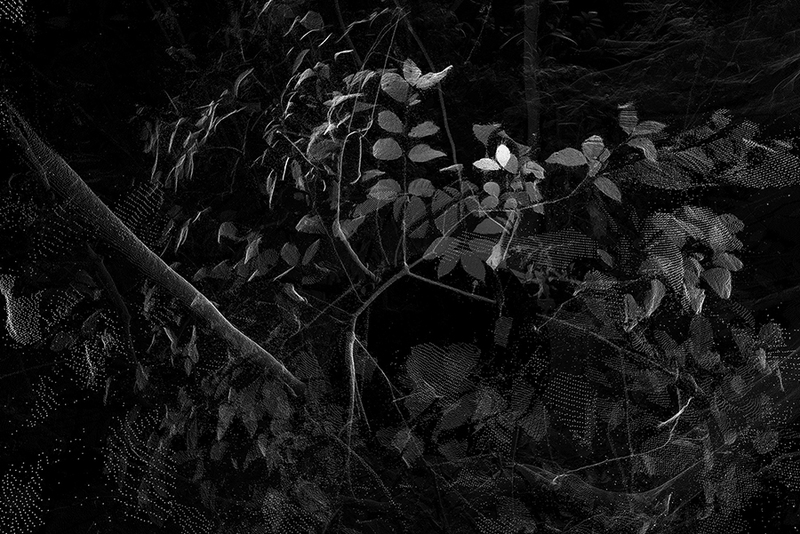 These shapes imitate the gaps between trees where sunlight penetrates the rainforest canopy, their precise angles created by a chance layering of geometric patterns derived from his Systemic Grid series. 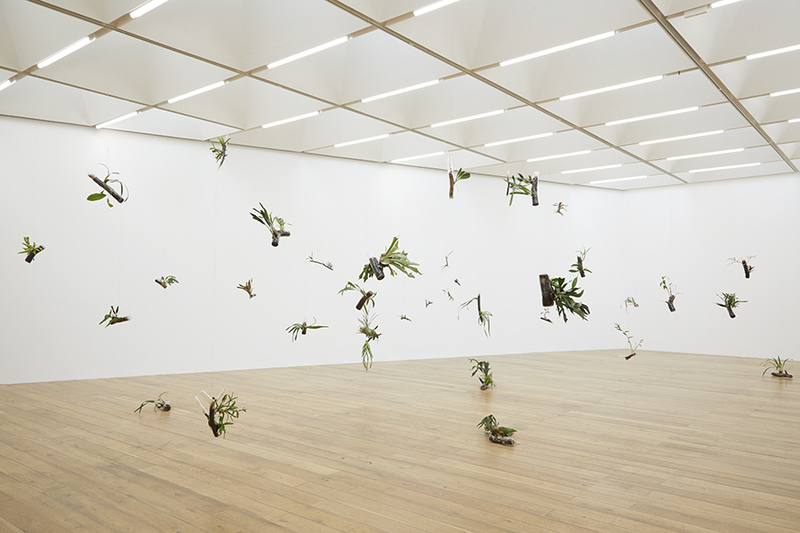 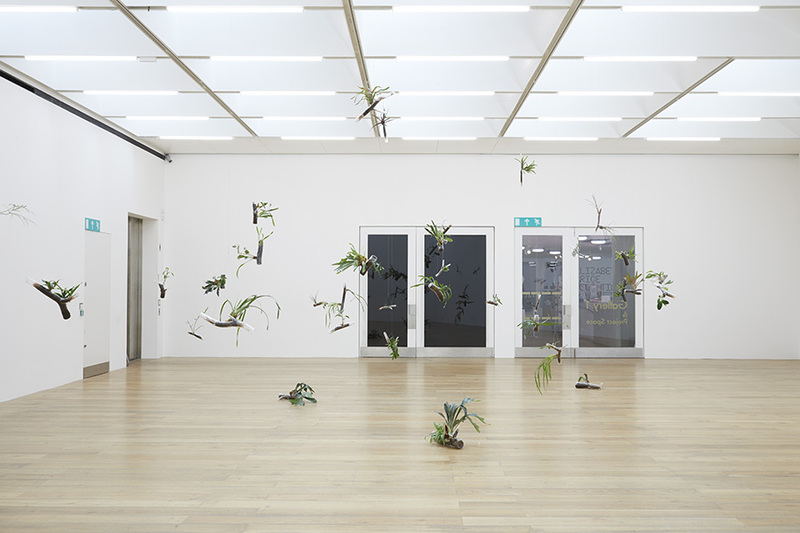 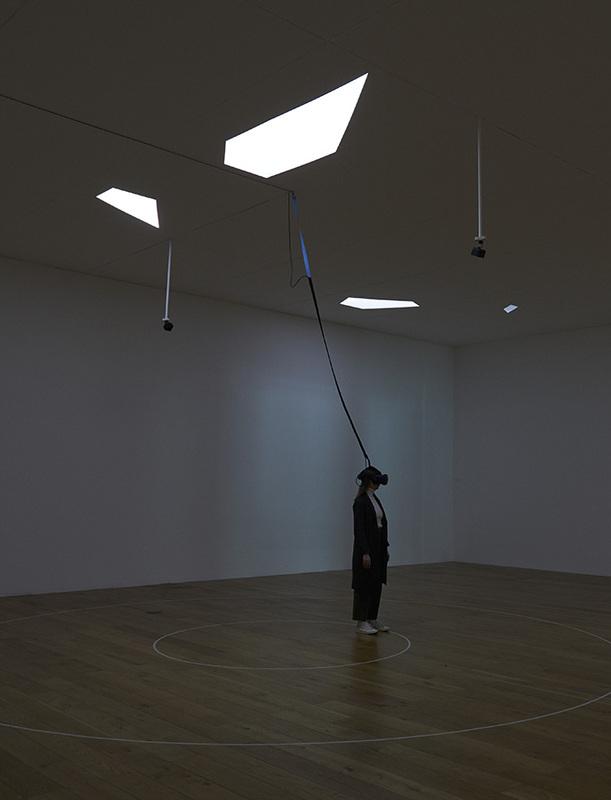 Programmed by James Brower at Nottingham Contemporary the skylights gather weather information from the Brazilian rainforest in realtime and reproduce its changing variations in the gallery, continuously transforming the experience of the space. 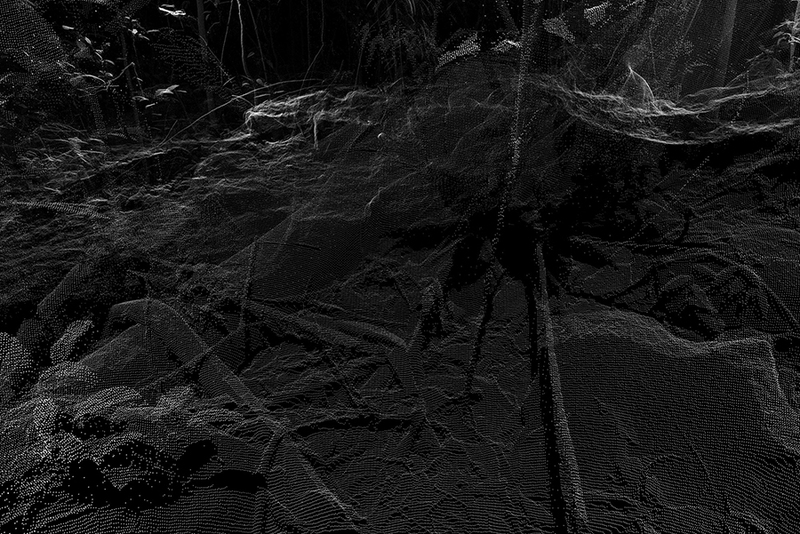 In 2014 Steegmann Mangrané commissioned aScanLAB to create a 3D scan of a section of the rapidly disappearing Mata Atlântica and render it it in Virtual Reality. 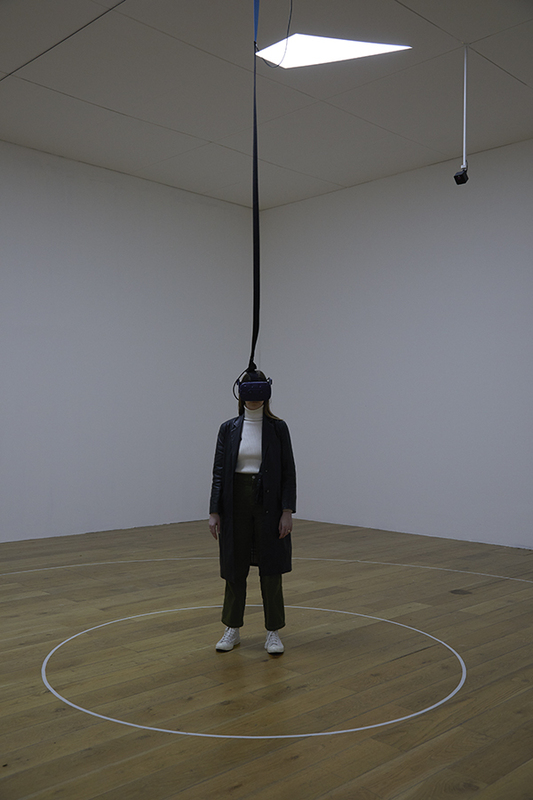 In Phantom, the resulting work, the viewer is literally immersed into the environment, with the headset covering the entire field of vision and the physical body obliterated by the image – look down at your feet while wearing the headset and you will see only soil and plants. 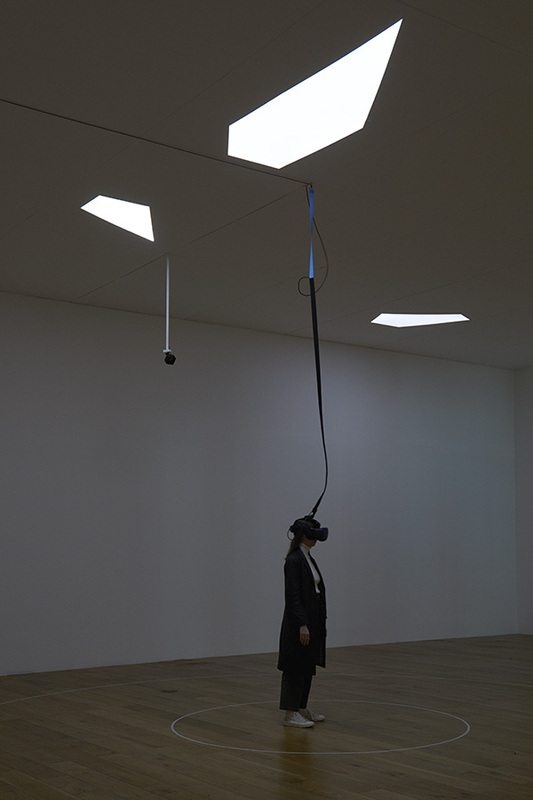 Steegmann Mangrané is interested in the dissolution of the body that occurs when we experience Phantom, and how this leads to us occupying another point of view than that of ourselves. 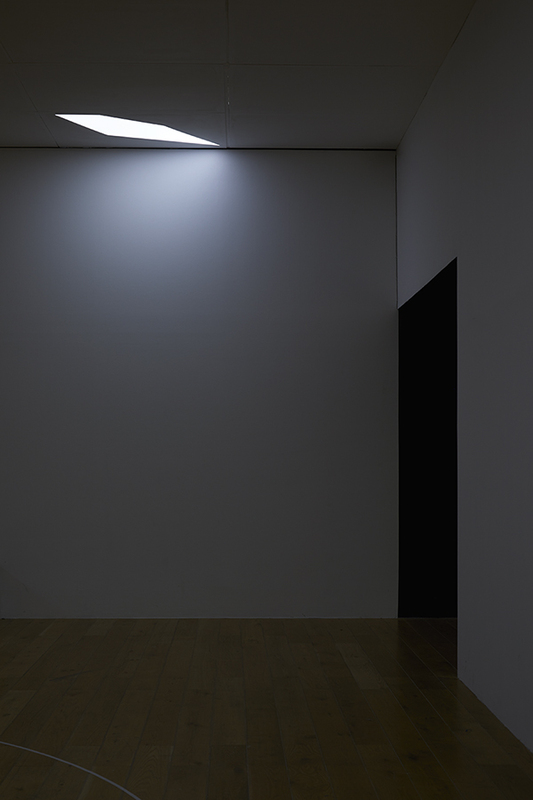 Equally important is how the experience experience appears from the outside and how onlookers felt in a different space than the user. 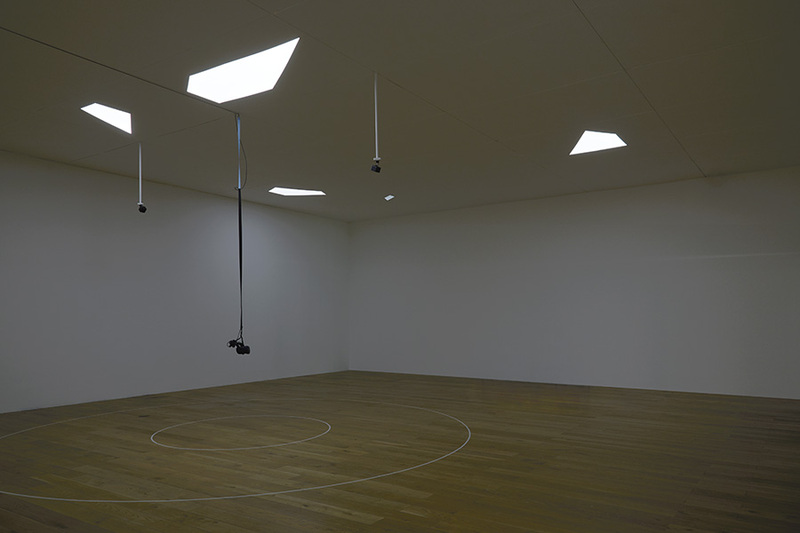 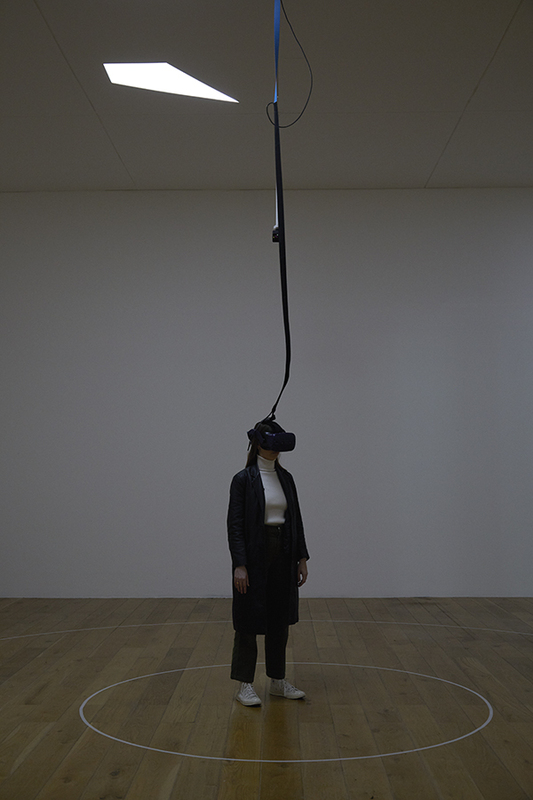 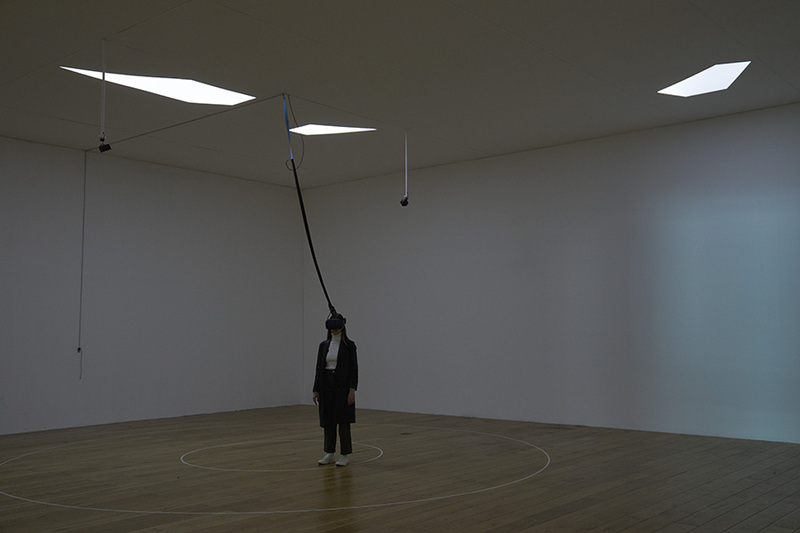 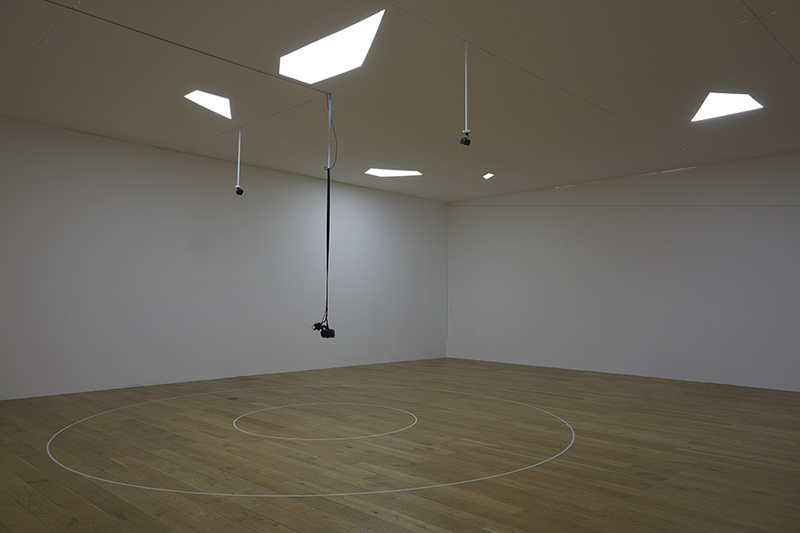 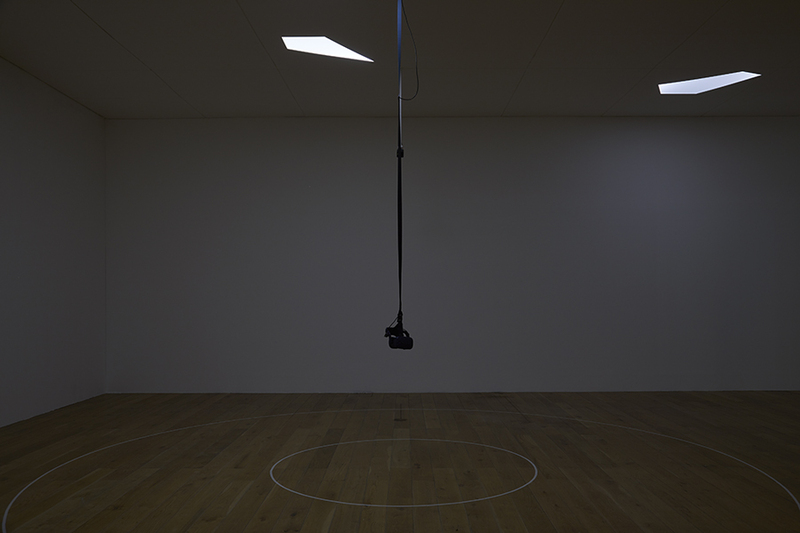 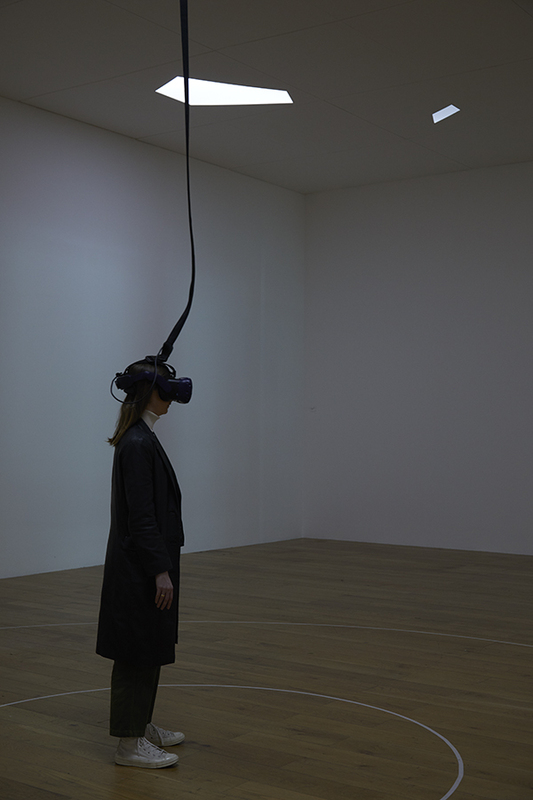 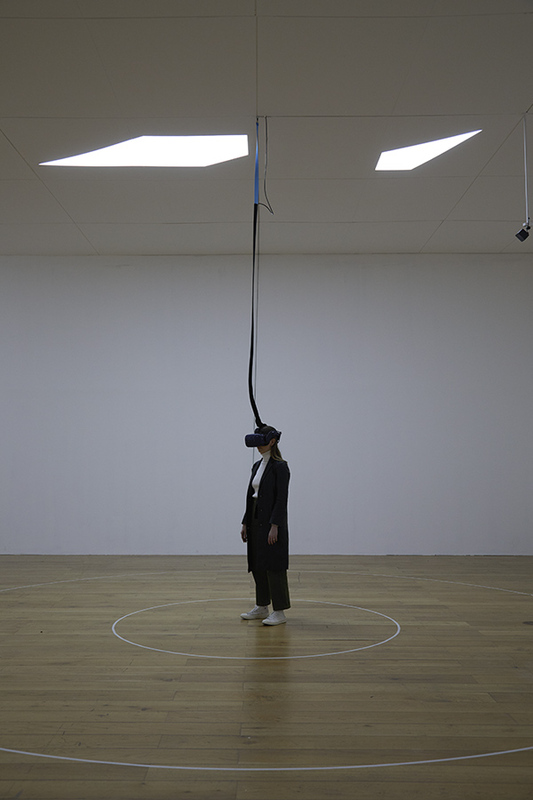 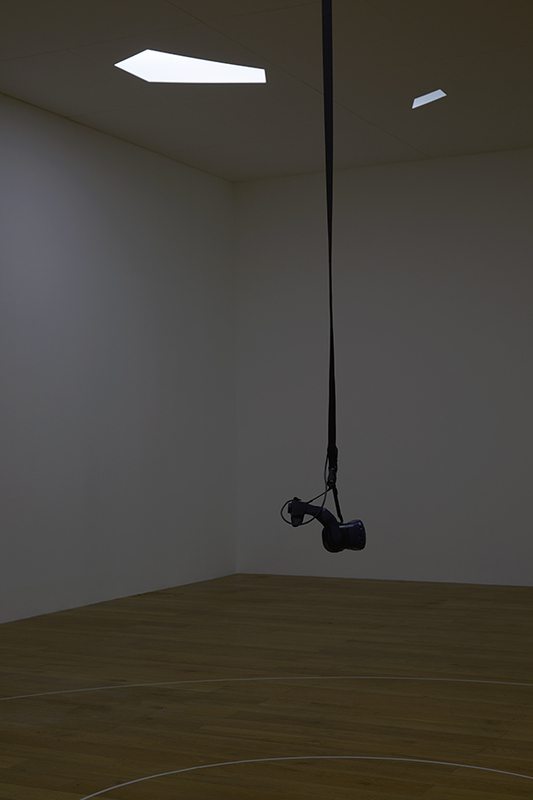 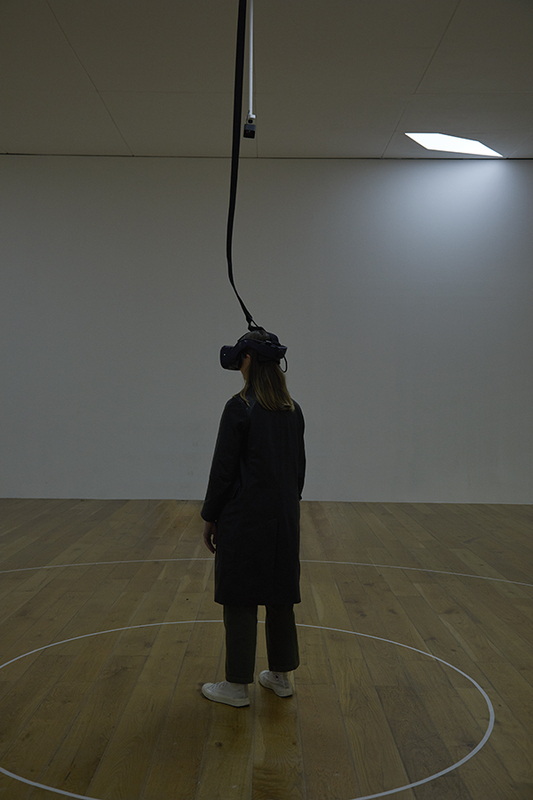 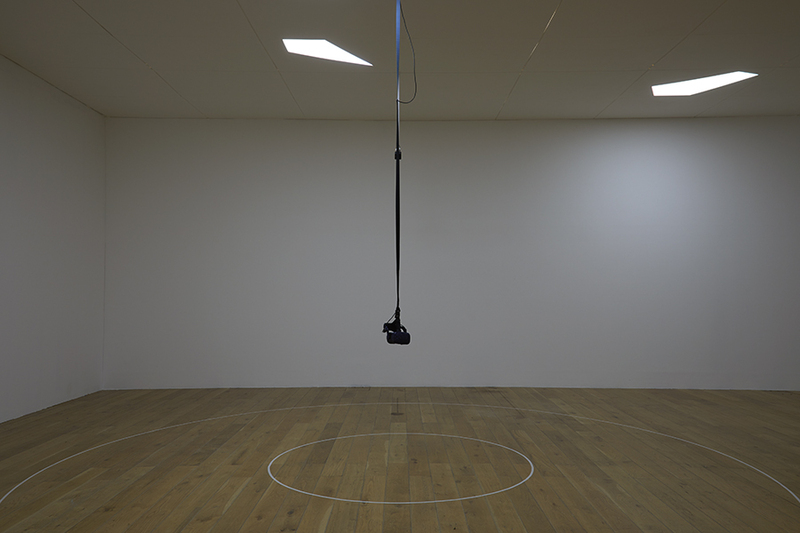 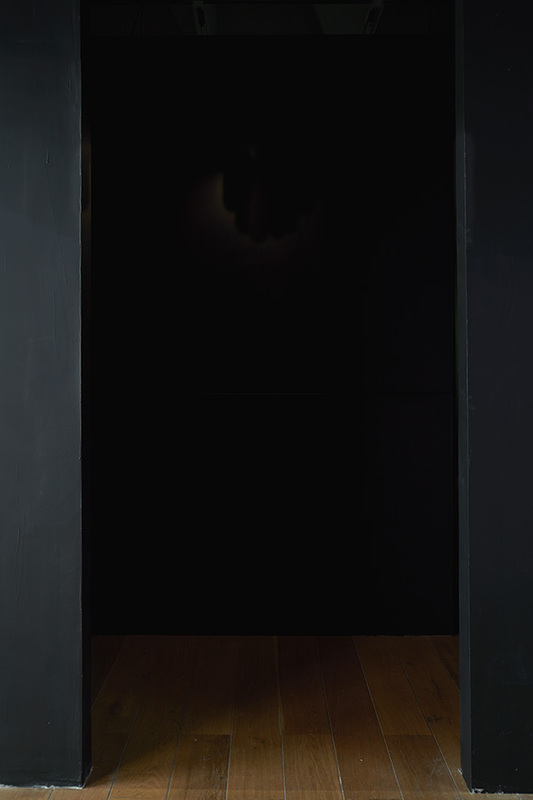 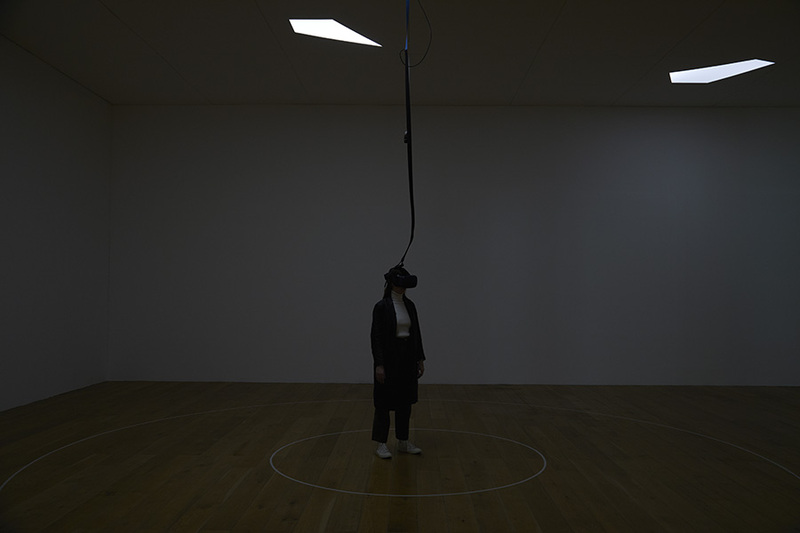 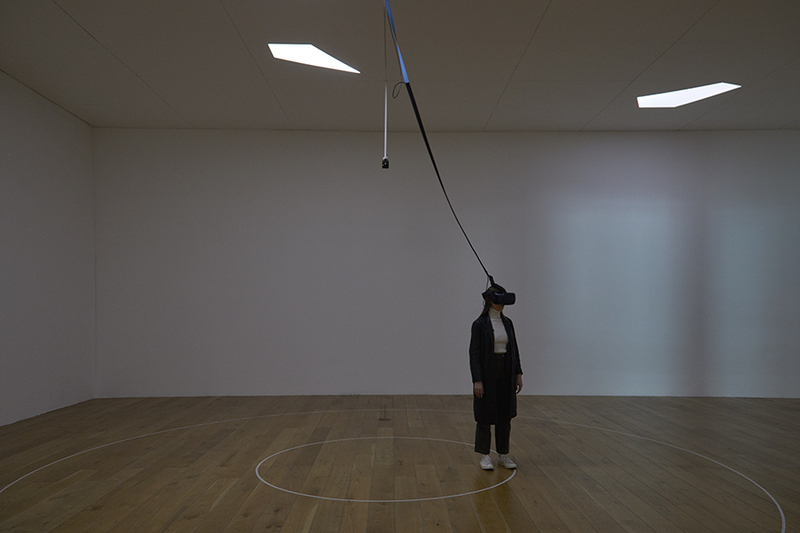 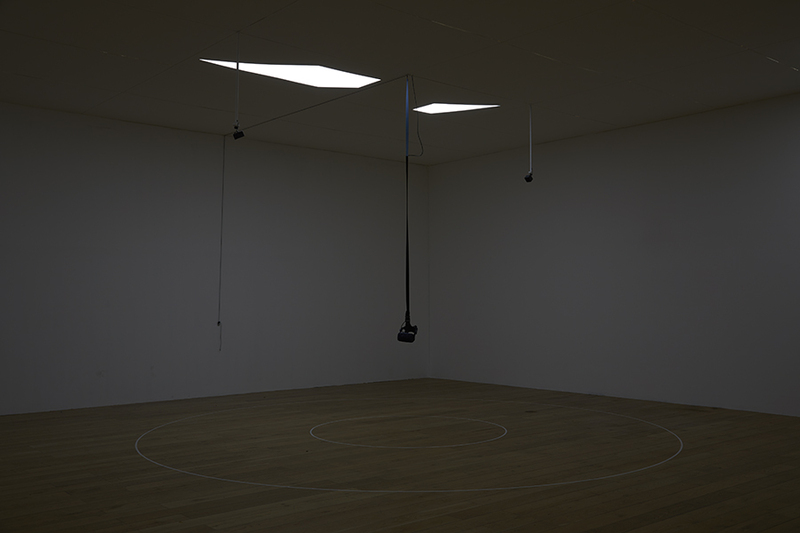 Within the white circle on the gallery floor that indicates the "performance" area to be explored wearing the headset, the person experiencing becomes an inadvertent performer, their movements describing the environment they are discovering to the audience "outside". 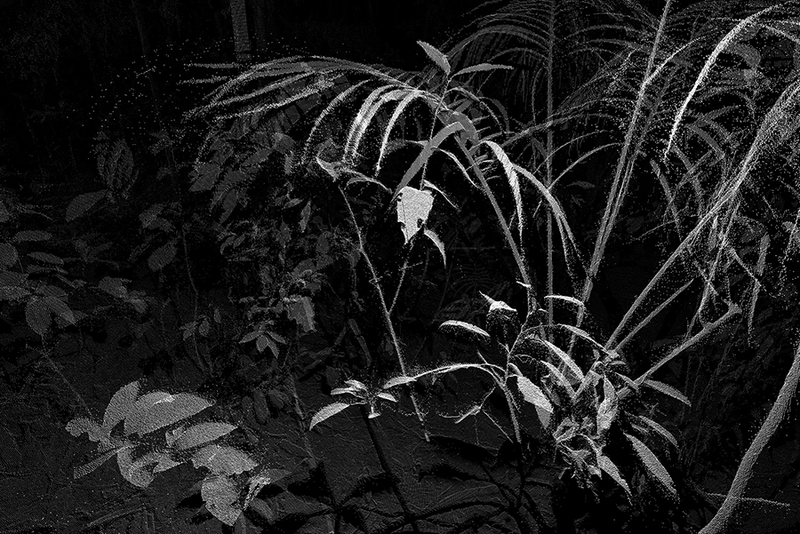 In 16mm, a camera traces a perfectly straight line through the chaos of the rainforest, becoming gradually engulfed by the trees and plant life. 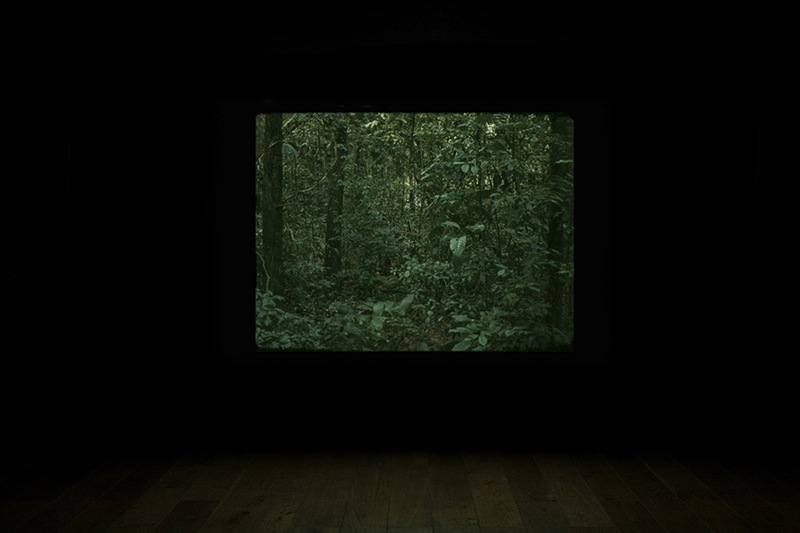 Following Structuralist film-making principles, Steegmann Mangrané uses the roll of film as a starting point for the work’s form and content. Using a modified 16mm camera and a specially built dolly, the footage was filmed with the camera moving along a cable at the same speed that the film itself ran through the camera. 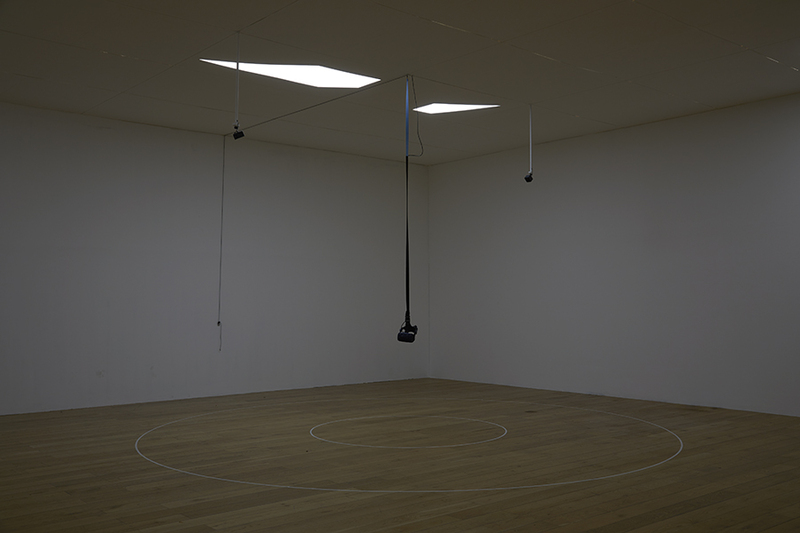 One single motor ran the camera and propelled it forward, so the two movements and the two ‘distances’ become directly and mechanically connected. 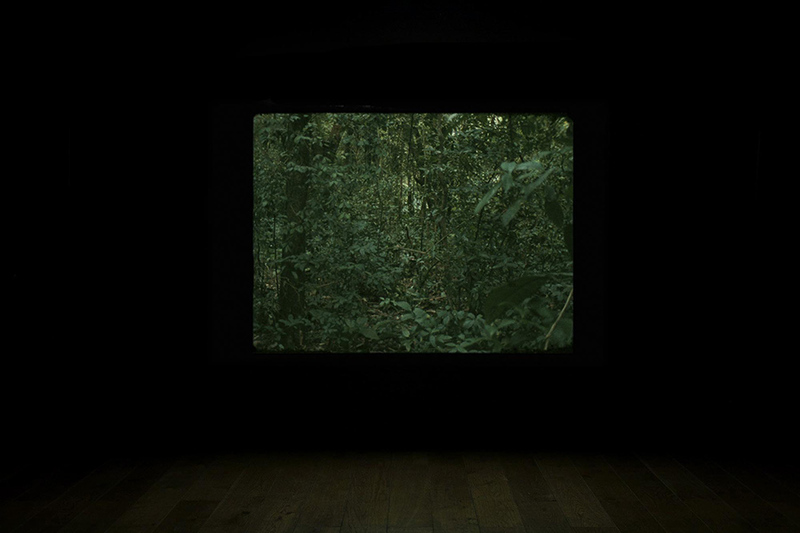 The result is a continuous take, a long shot travelling with constant speed through the rainforest, going deeper into it, for a total distance of 200 feet – or the duration of a standard roll of 16mm film. 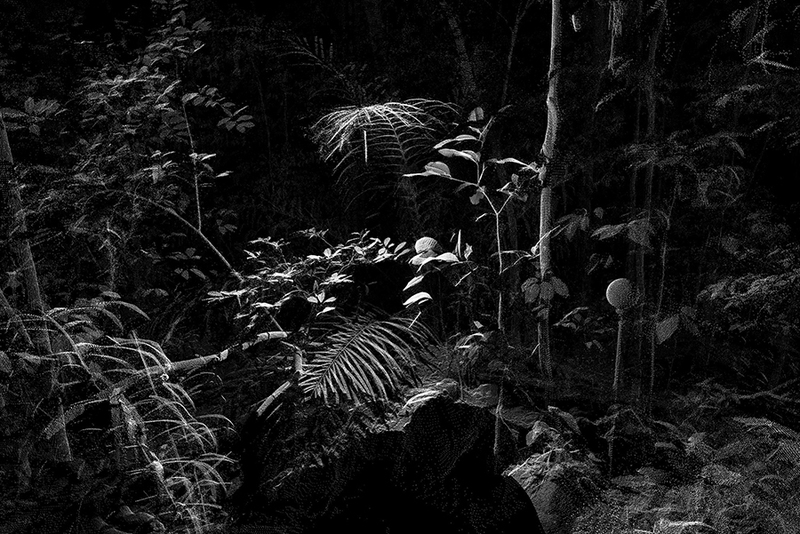 The Mata Atlântica is one of the richest ecosystems in biodiversity, with more than 23,000 species of plants documented so far. 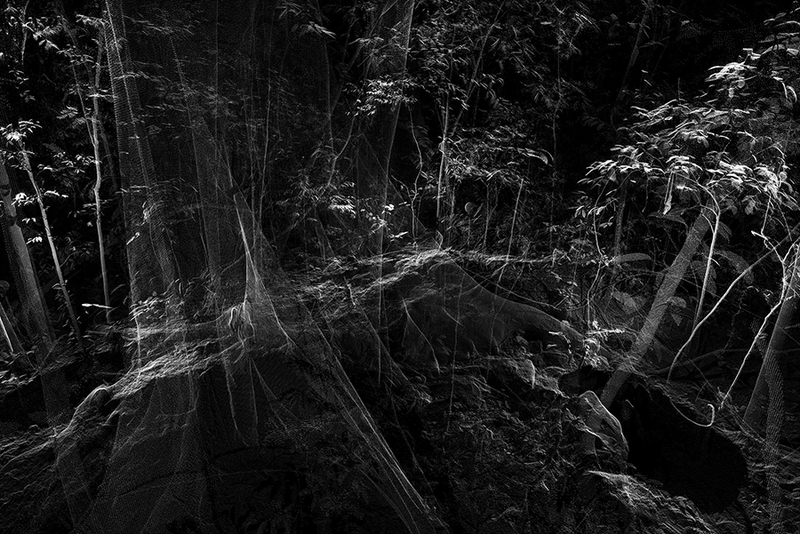 It is also one of the most endangered environments on the planet. 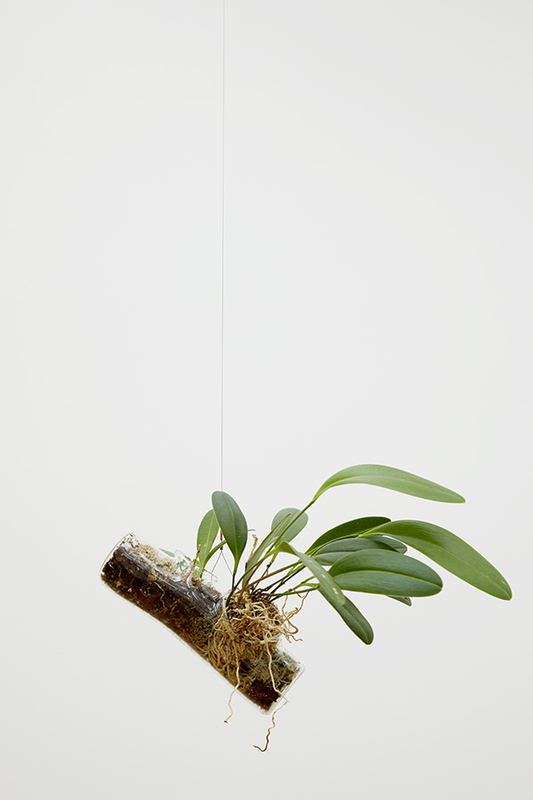 Working with the London-based glass-maker Jochen Holz, Steegmann Mangrané has created 35 hand-blown ‘branches’. 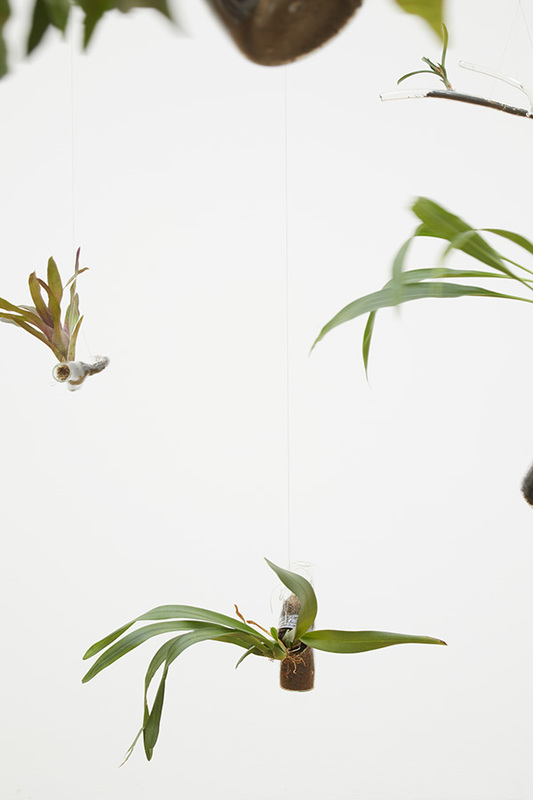 Orchids, ferns, cactuses, mosses and bromeliads sprout from or attach themselves to the branches, mimicking the layering of different species that occurs in the rainforest where, in a fight for nutrients sun and water, many plants grow as epiphytes, or air plants, anchoring themselves to the branches of trees (?) 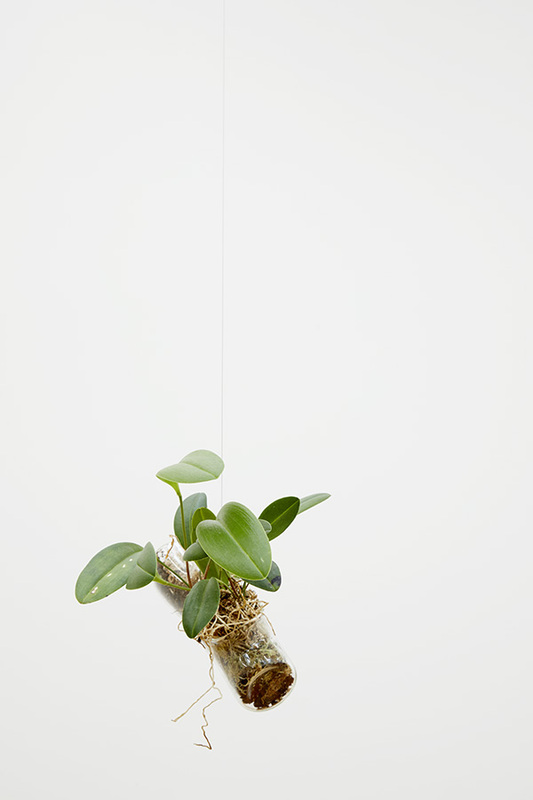 for support whilst deriving all of their nutrients and moisture from the surrounding atmosphere and falling litter. 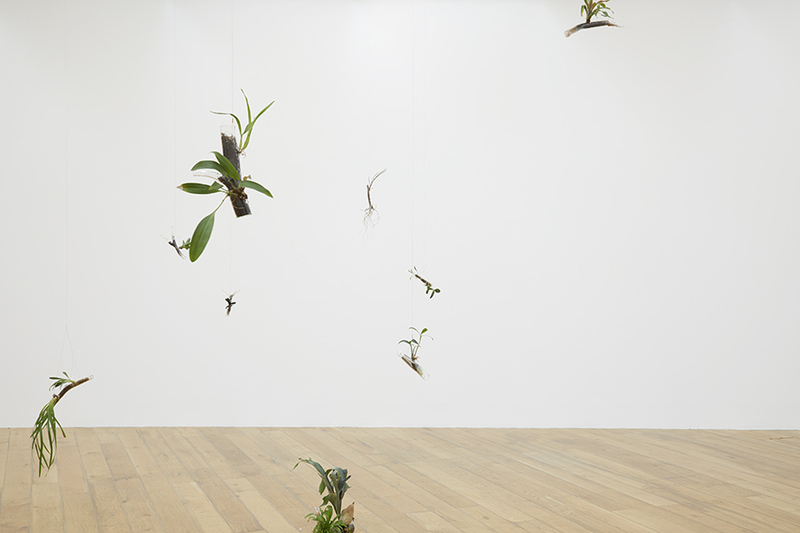 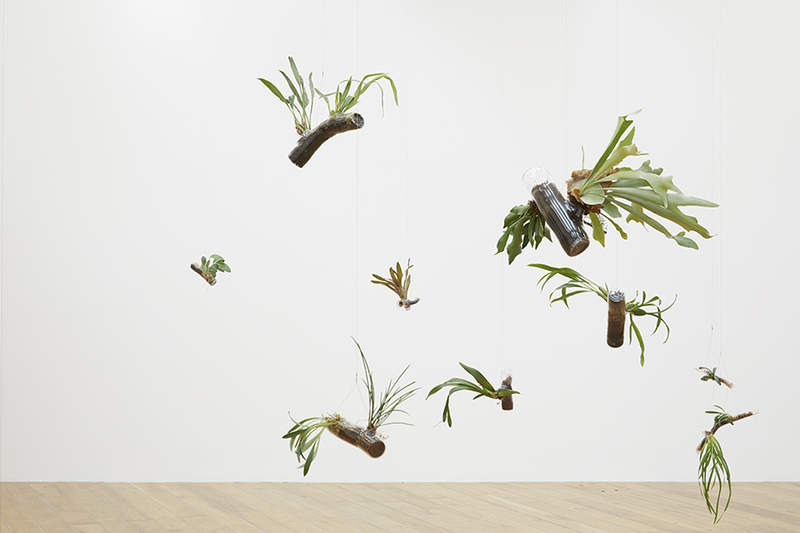 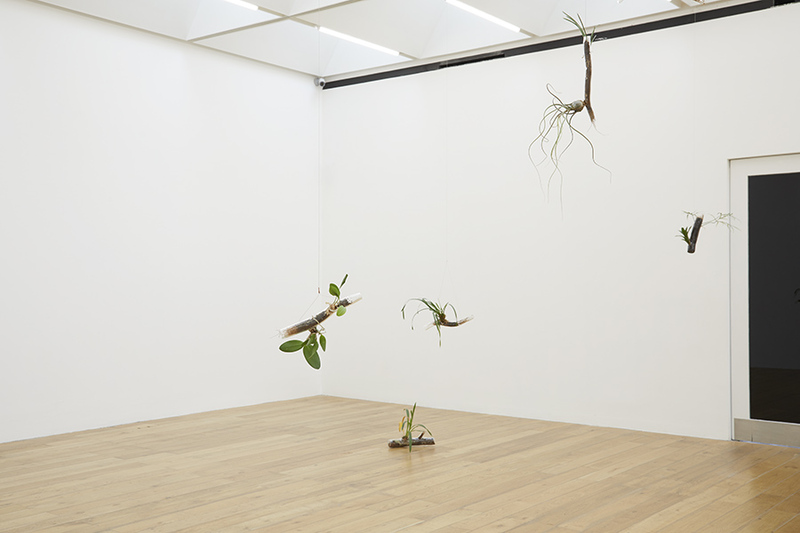 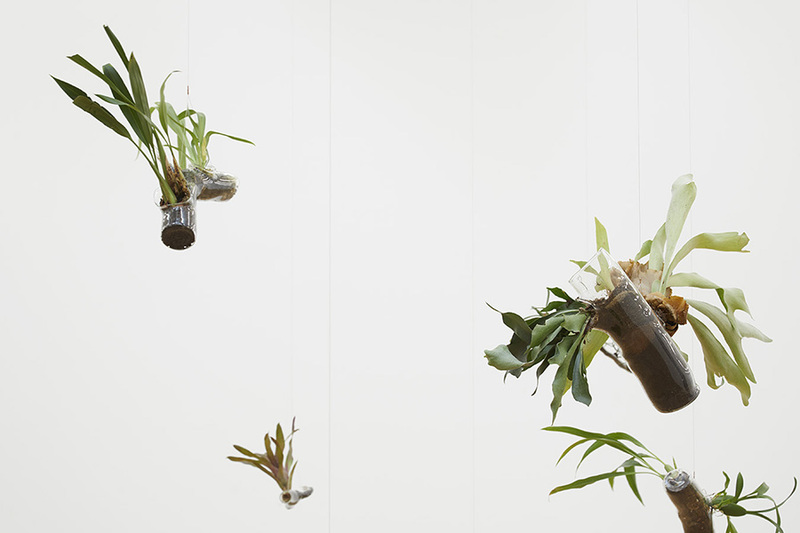 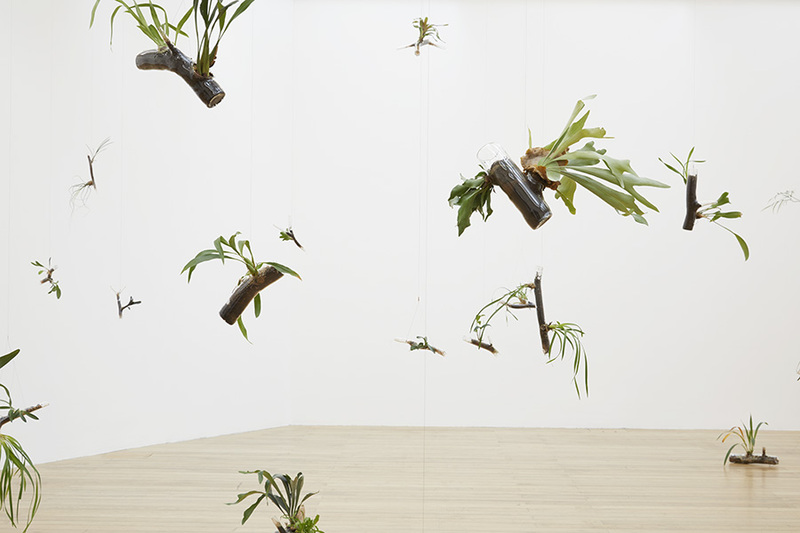 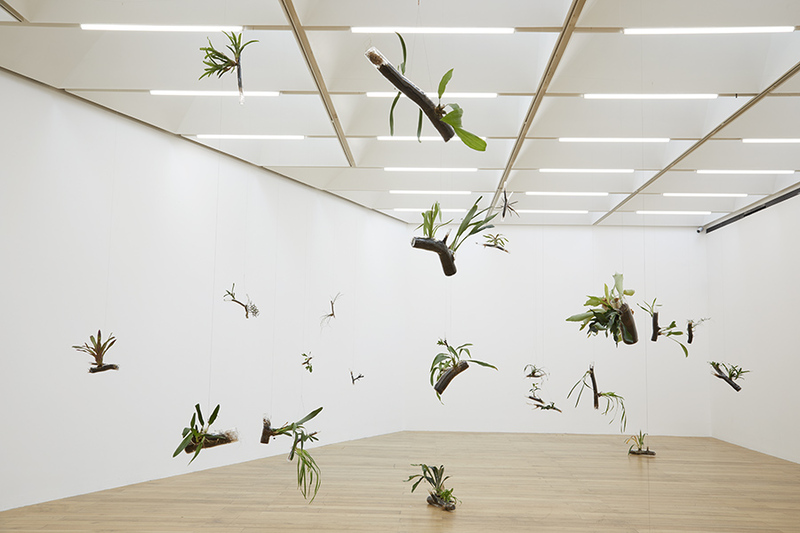 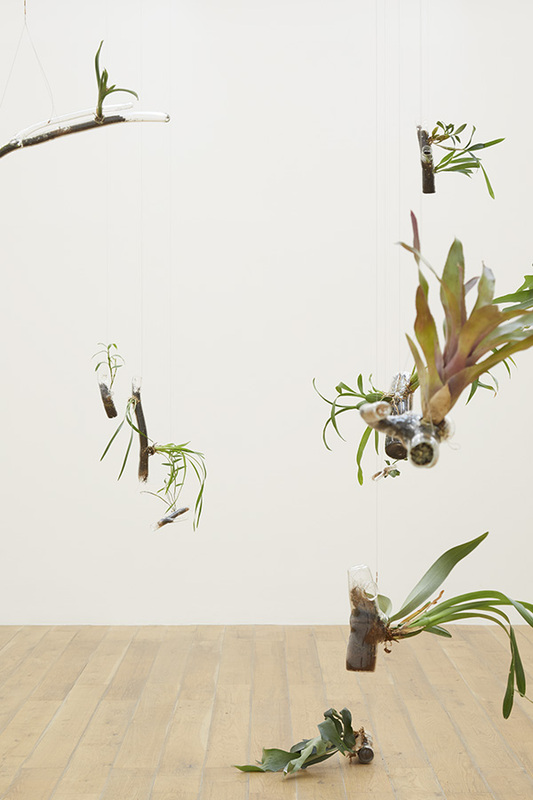 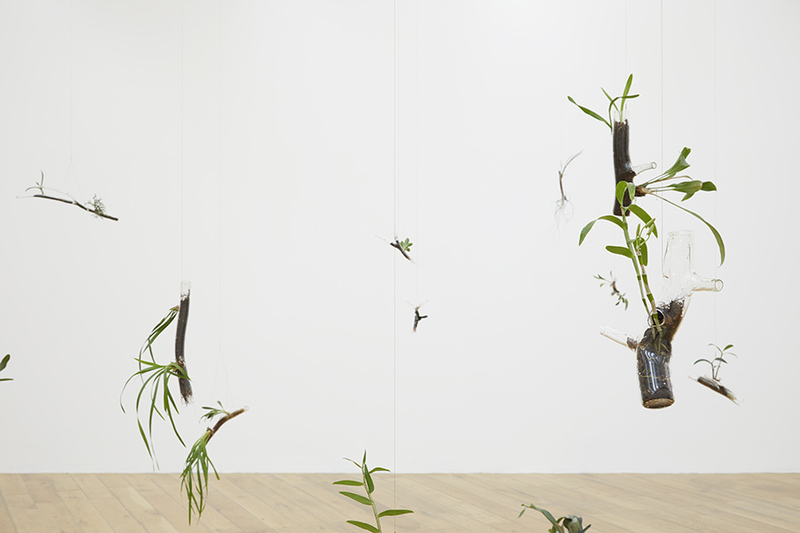 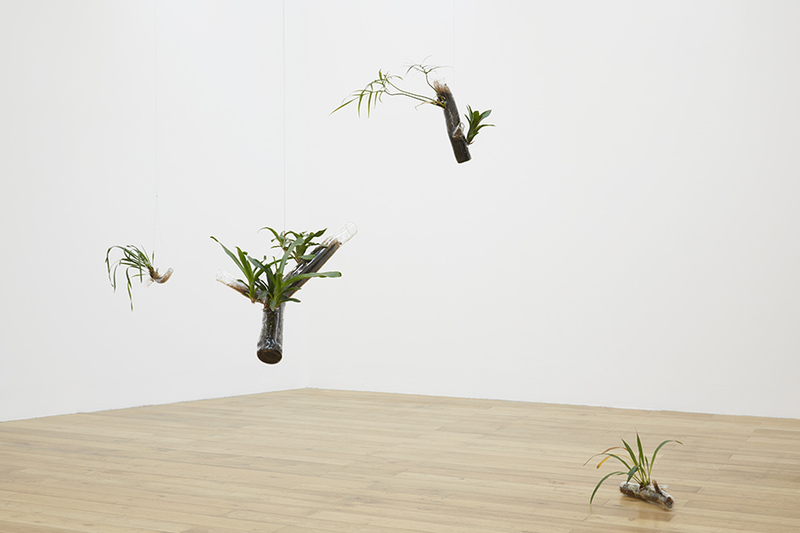 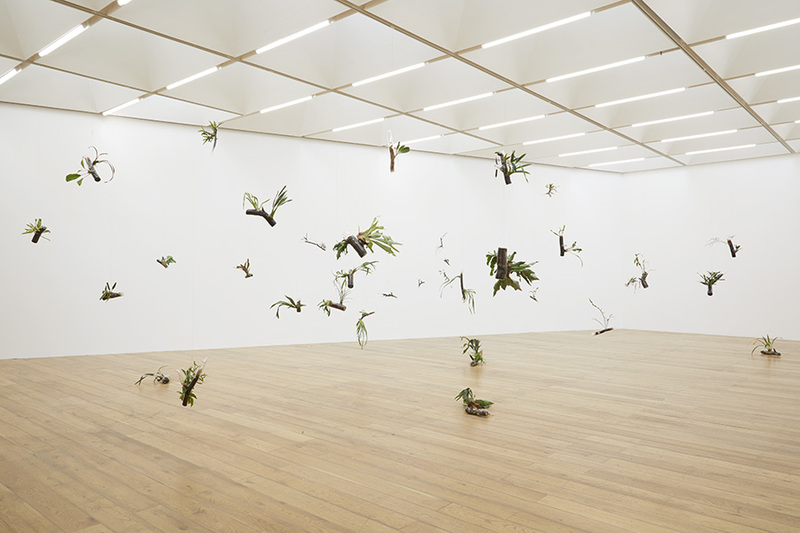 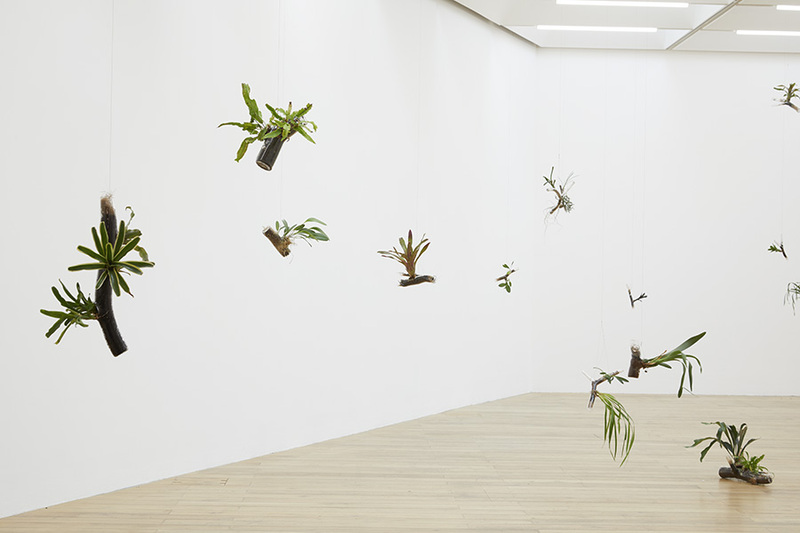 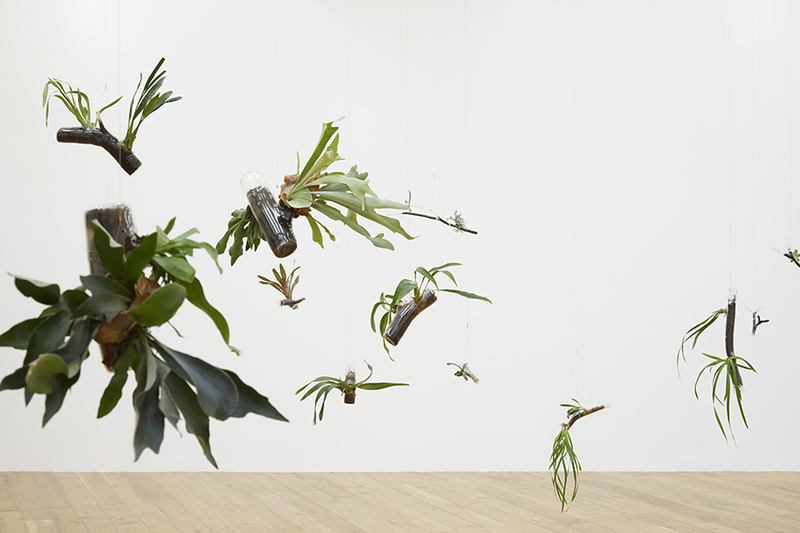 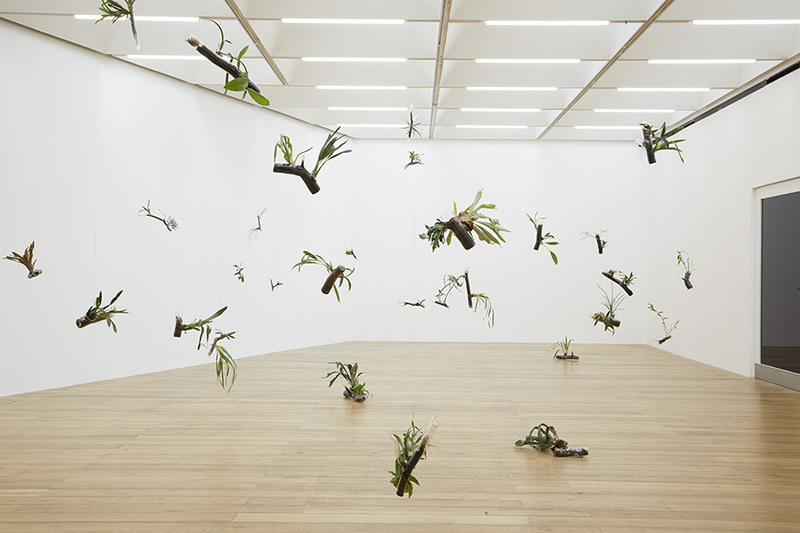 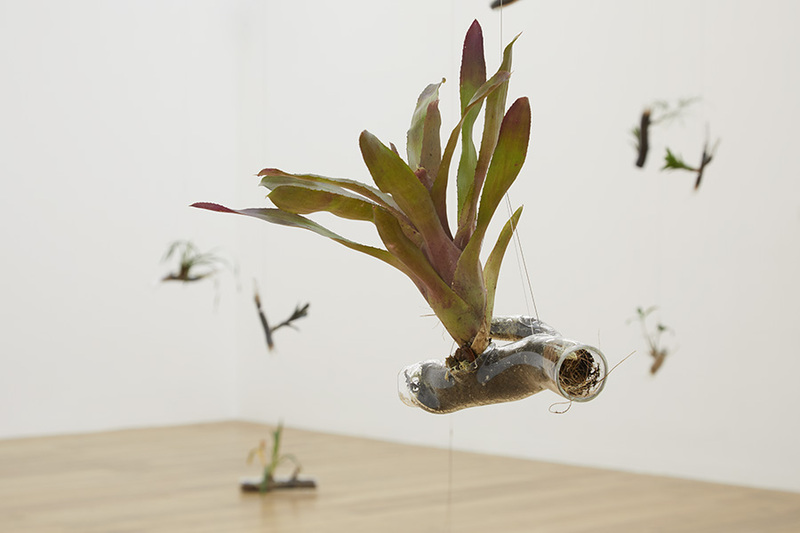 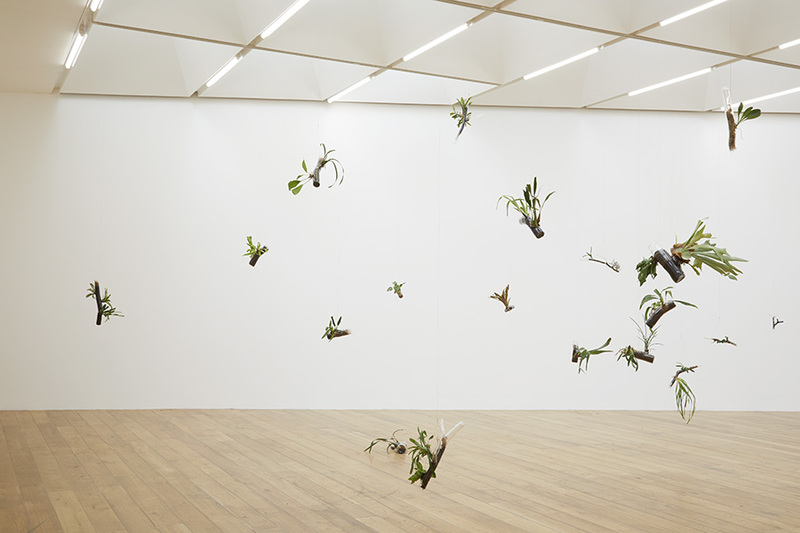 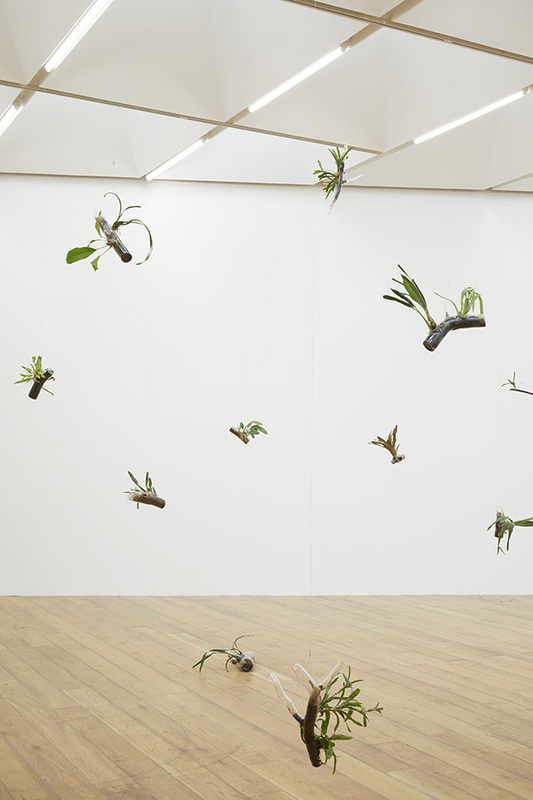 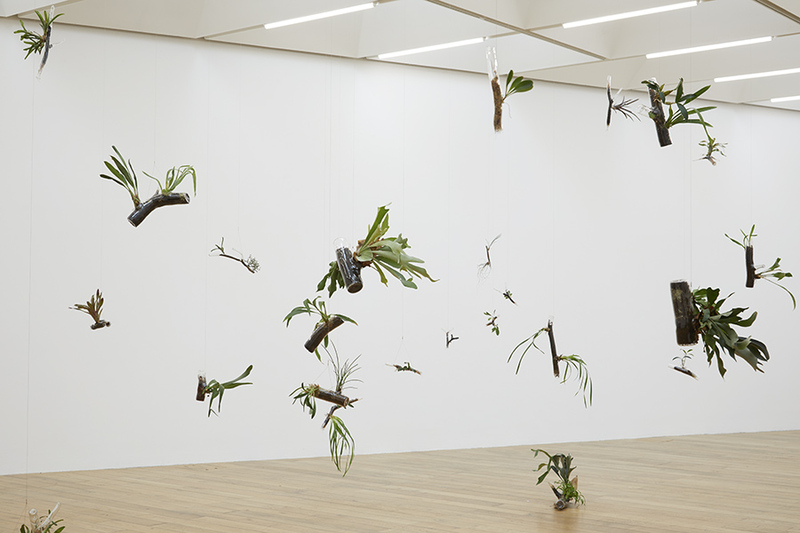 Appearing like samples or specimens, the hanging branches offer a glimpse of this dense, natural environment, like a model of the rainforest where everything but the ephiphytes themselves have become invisible.